EVP Andrew Wilson intends to "re-establish Origin as a service to gamers, not as a means to drive transactions"
When Electronic Arts reorganized a couple of months ago, it gave EVP Andrew Wilson the task of managing Origin to add to his responsibilities as head of EA Sports. 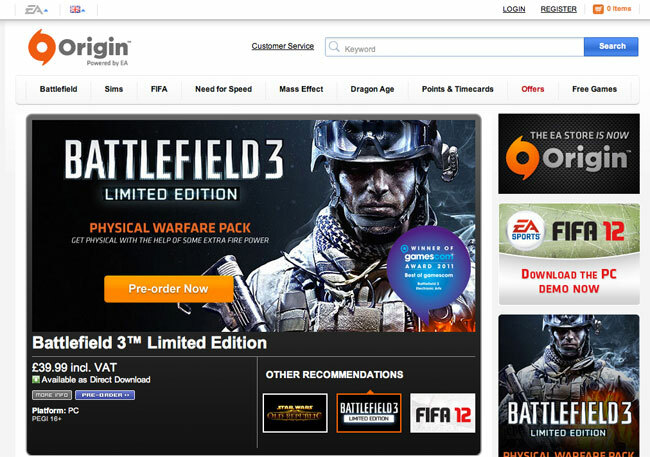 Electronic Arts re-branded its combination of the EA Store and the EA Download Manager as Origin in 2011. Origin has grown tremendously, and in the process has had to deal with creating a support structure able to handle the current and future customer bases; there was a lot of plumbing to do early on. The system is now supporting over 40 million customers. Where does Origin go from here? What mission has Andrew Wilson been given for Origin? GamesIndustry International sat down with Wilson at E3 to talk about the Origin service and how it will evolve. Wilson's history with Origin actually goes back to the early days of the service. "I had the great fortune of being on Origin back in the day; I was part of the first core team that had this kernel of an idea of what Origin could be," Wilson recalled. "It wasn't called Origin then - the subsequent team came in and branded it and built that service. But what we really had in mind in the early days was a service that made your EA games better; a service that made it easy to access games and update games. A service that enhanced the experience of playing games, a service that helped you connect to other friends playing games, and a service that ultimately did that across all platforms, not just PC." "The transaction component of that service has taken a disproportionate amount of the communication and mindshare of what we really try and provide"
Wilson acknowledged that the service has changed over time from that original vision. "Over the years ... there've been some permutations of that vision that have manifested as part of Origin," Wilson said. "I think what we've done is taken a step back and said 'Wow, we've actually done some really cool things with Origin.' It is by no means perfect, but we've done some pretty cool things. As you say, the plumbing is there. What can we do now to really think about Origin in the next generation?" The task of moving Origin forward requires going back to its founding ideas, Wilson believes. "Part of the reason why I think it came back in to me was my history with Origin," said Wilson. "And the ability to take a step back and say OK, now that we have the plumbing what does 'make your EA games better' mean? What does 'make it easier to access those games' mean? What does 'enhanced gameplay' mean? What does 'connect with friends' mean in the context of Origin, and what does that mean for the PC, for console, and for mobile? Really coming back to our roots as a service for gamers, versus anything else that it may have been perceived to have been over the last few years by virtue of its various permutations or changes in direction." When Origin was first released it seemed like it solved a lot of problems for EA, but it looked like it was built around what's useful for EA rather than what's useful for customers. There are now a lot of social networks to bring customers together, and digital distribution, and many other services that do some or all of what Origin does. For customers Origin can seem like just one more thing they have to install, another roadblock in the way of getting and playing a game. Until customers feel there's something in it for them, they won't install it. How does Wilson plan to make that change to Origin? "I think your perception is absolutely correct," Wilson agreed. "I think when I look at the journey that service has taken, I think the transaction component of that service has taken a disproportionate amount of the communication and mindshare of what we really try and provide, and the barrier that that puts in between you and the game that you want to play." Wilson is trying to change the core definition of Origin within EA. "When I speak to the team now, they're very energized about this concept of 'Listen, the transaction is really a very small part of the experience; that's really not what this is about,'" he said. Wilson notes that you have to have some software to download and install PC games, and that Origin has made that better. "In the old EA, there were multiple downloaders and multiple installers," Wilson pointed out. "Before you bought every game, you had to get a new downloader and a new installer. That was a barrier. Origin is one downloader, one installer. That solves a problem for the gamers who buy more than one game." Origin also makes the process of getting patches easier. "Again, we're not perfect, but we're getting better," Wilson said. Wilson points out other features Origin provides, including tracking your friends' status, chat and an overlay system for showing walk-throughs. "I don't want to have multiple technologies installed" to handle these various features, Wilson said. "I don't have to have separate technology. Origin does that. So if you take away the transaction part of that, which for us in all honesty is a very small part of the service, and you think about consistent downloads, consistent access and understanding of friends' presence, you think about game enhancements like chat and one-click join and in-game overlay, and all of a sudden you start to get to what Origin is - which is a service that makes your EA games better." Making EA games better is the core that Origin needs to embrace and expand on, Wilson believes. "What you're going to see from us is to have a real focus on that, and a focus on getting that right and getting that better, and getting it done for PC. Then figuring out in the context of other platforms, what does that mean?" Wilson asked. "You don't want a service that competes with other platforms like Microsoft or Sony or iOS. You don't want a competitive service to them, what you want is a complementary service that enhances your game experience irrespective of where you made the transaction. That's the shift you're going to see from us." The technology needs to fade into the background as far as the customer is concerned. Apple has made a lot of money because they made buying things for iOS very painless. Doing that and making communication a seamless part of your game experience would be a significant benefit that Origin could provide. "You're absolutely right," Wilson agreed. "We think of Origin, in this new world, as the gracious host of the party. It's not the center of attention; it's not the DJ, it's not the dance director, it's just a gracious host. It's someone who greets you at the door and ushers you in to where you want to go and points you in the direction of your friends so that you can go and party with them together. That's really how we see it." "We think of Origin, in this new world, as the gracious host of the party"
There is a big difference between how Wilson would like Origin to be perceived and what customers actually think of the service, though. That's something that will have to be dealt with. "There are a number of years of built-up perception around what Origin is and why we need Origin and the focus of Origin," Wilson acknowledged. "I am not so naïve as to believe we will change that perception quickly. Certainly at a core Origin team level our job is to make your games better. There are things that Origin delivers that will in fact do that, and it can be completely silent and not come between you and your game." "What we are really looking at now is how do we make sure that that's possible," Wilson continued. "How do we make sure that if you never want to see that gracious host again, you don't have to - you go straight to the game. But if you want to call them up and you want to find out where your friends are, where the latest cool party is or whatever that might be, you can do that. I think that's the difference. One was let's put Origin front and center due to the perception that we were trying to drive the transaction, and where we are today is Origin is really only there to help your games be better, more seamless, and more fun, and allow you to play them with your friends more easily. That will be the razor by which we decide how on how we build new features and what we do. In the near term, quite frankly, our focus is making that download better, making that install better, making that automatic patching better. Making that friends presence better, making the various game services better. That's what you're going to see from us over the next year, which is really re-establish Origin as a service to gamers, not as a means to drive transactions." Wilson appreciates just how difficult this task will be. "I want to re-iterate, it's very important for people to understand that we don't expect that all of a sudden people are going to get up and go 'Oh! Great! We now love Origin!'" Wilson said. "Some people really do like Origin, for all of those reasons; other people don't because of some less than optimal experience they've had. Initial experiences are hard to overcome, and that's going to take time. What we would say is, 'We get it. We understand it. We have heard, we have made some changes already in terms of how we do things, and we're looking at more changes that we'll talk about over the coming months that really are gamer-focused.' That I think will prove as a litmus test and a change and a filter by which people see Origin. It will help them understand this is not just hot air. We actually want to build a service to gamers. Then the proof is in the pudding. We've got to do it. It's got to be there." The world will be watching to see just what sort of pudding EA produces, and what it tastes like once Wilson's changed the recipe. Read more about Andrew Wilson's plans for Origin, including what he says about Origin discounting games, on the [a]list daily. Valve/Steam seems to be the elephant in the room in this conversation, since everything that Origin is doing, or will do, is already in Steam. No disrespect meant to Andrew, but perhaps this is why there is now a focus on multi-platform'ing Origin - because PC is Valve's domain. Which makes me curious if there's going to be a continuation of the Origin exclusives that have led the "transaction oriented" strategy of Origin up to now, or whether some AAA titles will finally make their way on to Steam. In addition, repositioning Origin is fair enough, but EA's antagonism towards PC gaming - whether it be the lack of Ignite Engine games, or the lack of some games on Steam - seriously affects Origin as a brand, in a negative manner. Contrary to some people's beliefs, gamers don't love to hate EA, they just hate EA. It is going to take a lot to work away those old feelings, and I think it's something that has to be done on a company-wide scale, not just departmentally. You just don't get it, do you Andrew. 1) "All in one place to play games with your friends and chat"
No one wants Origin or uPlay. Why? It's not because Steam is better but because 1) of the very goals and principles uPlay and Origin aspire to and 2) Steam was here first. Since you are having trouble yourselves understanding this I'm going to break it down: YOU CANNOT HAVE MORE THAN ONE ALL IN ONE PLACE. This is a math problem. "There can be only one". And there's no way to have 2! Until the day Origin plugs right into my Steam account and shares all my friends (which will never happen most likely) it will always be a thorn in my side. Why? 2) If there can be only one all-in-one, why should I pick you? EA has a massive catalog of games. Exactly 0.1% are available to purchase on Origin. There is literally something like 15-20 games in the under $10 category. That's it. Origin is an extremely poor service in this regard. It's laughable (seriously, sometimes I turn it on just for a chuckle). UI wise I tend to like how it looks and flows but it's so empty & sparse it's like the Fallout desert of game services (radscorpit as massive a problem as it is, number 3 might be irrelevant (note some games do *require* Steam), but that's not where Origin is at. If you are going to tax me with Origin, you need to 1) give me good reasons to not hate it and 2) offer excellent support. Origin fails exceedingly hard in both these places. If EA had been braver they would have partnered with Valve in the past; Steam could very easily have had Company pages and Company Achievements yadda yadda yadda (I mean look at this card system they've got now). Obviously EA wanted the whole pie to itself, which is fine - but if that's the case EA needs to cook the whole pie themselves too. As it stands Origin is a paper copy of a recipe of a pie we've been promised, don't want, and is being stuffed down our throats. Phew! Thanks for reading my article everyone! And now you know how to fix Origin Andrew: 1) massive backlog of games for a low price 2) Steam friend finder/importer 3) easier access to human support. I'll check back on you when the new BioWare game comes out and I'm forced to turn Origin on again. It amuses me that Andrew readily accepts that users don't want multiple programs installed to do things like chat and have walk-throughs, but easily ignores that point when it comes to having multiple programs to start all the games that they have purchased. Based on past experience working as a developer inside companies that have generated unnecessary annoyances like this, this is likely not a conscious decision made based on the trade-offs involved, but just a combination of poor programming ability combined with a lack of customer focus deep in the organization. It's easy to install a new manager at the top who wants to fix these sorts of things, but much harder to propagate the change in attitude down to the lower levels. Especially if you have developers and development managers who are not very skilled (a very frequent occurence), you may simply be unable to dig yourself out of the hole they've dug themselves in to. "Re-establish - to establish (something) again"
It may have been established internally that this was the target but I'm not sure consumers have ever seen this aspect. It just needs to be established, full stop! There is no choice which service to use. If you buy games based on their quality and not their distribution, then chances are, you have both services installed. If you have friends on the PC, then chances are you organize them with something games-agnostic, such as Skype, ICQ, Facebook, etc. Because they are your friends. You will launch the program granting access to them before you launch the program to launch a game. If you just need "some guys to play against", then sure, both services are competent to match you up. But that alone does not make them "social". One key difference really is the shopping experience. Without browsing there, I could not even tell you whether or not there is an "Origin sale" right now. Whereas on Steam, the question is not whether something is being discounted, the question is which game from the massive library is being discounted. That is a very important distinction when it comes to RPU in the long run. I will be honest, it is a terrible service provider. @ Klaus Really? I'm not aware of any quality games I should have Origin to play exclusively at this time. Battlefield 3 was hugely disappointing, as were Dragon Age II, Dead Space 3, and SimCity. Luckily EA stopped being competent at making games at the same time they tried to force me to use their terrible service. And it IS a reasonable choice to make. Running multiple services is bad for PC performance, bad for community and communication with friends, and awkward for managing your game library. Also I'm not sure you are a PC gamer. LOTS of PC gamers consistently communicate and organize through Steam exclusively, and keep Steam online at all times. There are also massive Steam sub-comunities, forums, and groups. It's absolutely a primary social network for millions of people who play games together. OTS of PC gamers consistently communicate and organize through Steam exclusively, and keep Steam online at all times. There are also massive Steam sub-comunities, forums, and groups. It's absolutely a primary social network for millions of people who play games together. I haven't looked on origin lately, but I would really like to buy PC versions of Desert/Jungle/Urban Strike. Steam has loads of old games, Ubisoft have made loads of their PC back catalogue through Steam and GoG. Origin can't even get putting their own back catalogue out right.